Who doesn’t love potato and cheese? Throw in some bacon and seasonings and you have the ingredients for a simple and inexpensive tater tot casserole, which will feed a family of 4 to 6 a nice size portion. If you shop for items when they’re on sale and use a coupon or two, this side dish becomes even cheaper. Open your can of cream of chicken and mix in the milk. You want a loose consistency, but not too runny. Add in the crumbled bacon. Set aside. Spray a medium sized baking dish with oil spray or add oil and spread around the dish. Next add your tater tots, then salt and pepper. 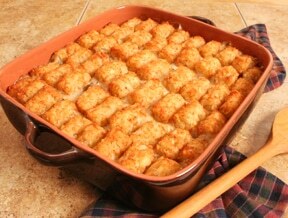 Pour the liquid mixture over the tater tots evenly. Add the package of cheese over the top. If you want you can dice up green onions, jalapeños or green chilies and add them to the dish as a topper with the cheese. Bake in the oven at 425 degrees for about thirty minutes or until the tots a cooked through. Serve hot or cool. This is a great dish to have for a side, to be served with burgers if you’re tired of chips.